One time, when I went to visit my parents in Chicago, my mom had a freshly baked loaf of "Amish Friendship Bread" for me to try. It was absolutely delicious! She explained the premise of how the bread is made and how batches are given to friends so that they can continue the chain of bread making. When I heard that Darien Gee had written a book called "Friendship Bread," I told my mom about it right away. I also knew that we had to feature Darien for "friendship month," as this novel will be available in paperback in early May. Darien Gee is an author, wife, and mother of three. She’s a Libra Monkey, a chocoholic, and of late, an Amish Friendship Bread addict. (She and I have a few things in common, as we're both married with three kids and chocoholics.) A former California resident, Darien served on the board of the Friends of the San Francisco Public Library and ZYZZYVA, an award-winning literary journal. She’s an alum of Squaw Valley Community of Writers. Her next Avalon novel, "Memory Keeping," will be published in 2013 by Ballantine Books. You may also recognize her as Mia King, author of "Good Things," "Sweet Life" and "Table Manners." 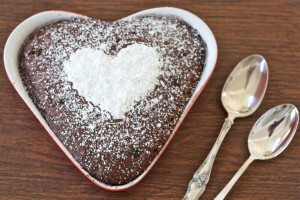 You can find Darien at her website (where she has recipes for Amish Friendship Bread), Facebook and Twitter. 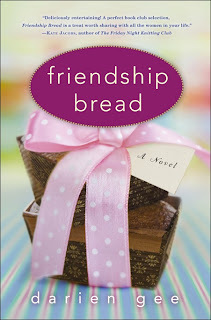 Darien has two copies of "Friendship Bread" for some lucky US readers! It was a bit like love at first sight -- from across a crowded field of college students. I'd never met her before but we were going to talk about planning an event together, and when I spotted her, I knew. Learning how to make pesto. We were figuring out what to make for dinner one night -- our regular fare was completely uninspired -- and she brought out her blender and a handful of basil leaves. It was so easy, I'd have to say that was probably the first time I realized how fun and easy cooking could be. We were at a wedding and nobody was using the disposable cameras on the tables. So, not wanting the bride and groom to be disappointed, we started snapping shots but ended up taking more pictures of ourselves than anyone else. I felt bad afterwards, but the bride and groom later told us the pictures made them laugh and a montage made it into their "official" wedding album. Got on a plane the minute I went into labor with my third child. Celebrity you'd like to be best friends with? Special thanks to Darien for visiting with us and sharing her book with our readers! 1. Please tell us: What is your favorite memory of you and your best friend? US only. Giveaway ends April 1st at midnight EST. Some of my favorite memories with my friends have been when we've taken vacations together! I think my favorite memories ofmy best friend are about to happen. First vacation together starts tonight. My favorite memory of me and my best friend are those quiet times curled up at our first apt after college watching tv and hanging out. Best memories are cooking together, making little 'parties' for two for New Years, birthdays, etc - out on the patio, dressing up the living room - and just kicking back & enjoying the fruits of our labor! My favorite memory of my best friends is when we all got together and took a road trip to visit random places. My favorite memories are of my friend and I starting kindergarden together and going to her house to play after school. We also attended the same church and went to Sunday School together. We graduated together. I still keep in touch with her. Although we aren't as close now, she will always be my friend! We have so many great memories, but the times stayed awake all night talking are the ones I think about and miss the most. My favorite memory is of us taking our babies to Sea World together and watching them climb around in the kids play area. We went at least once a week for years. My favorite memory with my friends was when we had an adult slumber party--popcorn and movies, and waking the next morning for brunch and a long walk in the woods. I think our best memories are yet to come. My favorite memory of me and my best friend is using a ladder to take a lot of self timed photos together outside her house. My favorite memories of my best friend include her inviting herself over to my friend's houses when we were bored so we could swim in their pool. My favorite memory of my best friend is sitting in her pear tree during those lazy summers, eating pears. We sometimes spent most of the day in that tree. I lost touch with her for many, many years and have now reconnected. I will be seeing her again in May! I can't wait! I am sure we will just pick up where we left off - I should bring a basket of pears! I am a GFC follower. And I follow on Facebook. This book sounds so good! One memory I have with my best friend actually is about Amish Friendship Bread - she was always making it: for co-workers, members of her congregation, Boy Scout den mothers, etc. I used to help her as much as I could (I am NOT a kitchen person) and remember having great conversations over the preparation. Just hanging out and laughing. I am a follower; facebook, twitter, blog. The memory that I have of when I was younger with my best friend from childhood is probably spending entire summers living at eachothers homes. I am very fortunate to have several best friends, and picking a favorite memory is hard. I think when we were in a hotel in San Francisco years ago, and the fire bells rang, and rang, and we realized something was wrong, but were not able to leave our room till we were fully dressed, had on our pearls, and had brushed out teeth! We ran into the firemen at the elevator, who told us were were obviously from NY, and anyone else would have run right out in our pajamas! AND I adored "The Friendship Bread" last year, and thought the cover was fabulous! One of my best memories of my best friend is when we went to see Sunset Boulevard together. Forgot to put my e-mail on previous entry. Wow, too many great memories to choose from. We have been best friends for almost our whole lives. We went through school and jobs together. Went to each others weddings and parties. I honestly can't think of a specific single event. The whole experience of knowing this person has been just great for me. There, it took me 3 posts to get all my entries in. It's late, I must be tired. G'night!